“Free Coffee and Eternal Life.” That’s the essential mission statement of any Episcopal church I’ve ever cared to be associated with. Unfortunately most vestries won’t adopt this as their actual mission statement. Something about not being taken seriously by…anybody. 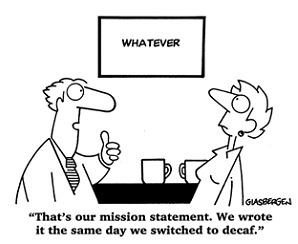 If you’ve ever been through a process to revise your parish’s mission statement, you may not be able to read this because you’ve been comatose ever since that ninth committee meeting. Group writing projects that seek consensus are brutal. And they’re rife with semi-colons. A general rule of thumb when church shopping on the internet? If the mission statement has more than four semi-colons, don’t even waste your time with a visit. You’ll likely end up on the vestry in that short but heady time between filling out a newcomer’s card and being sent a pledge card. We’ve started looking at the mission statement at St. John’s as a precursor to engaging in some strategic planning. I actually enjoy the process (don’t tell anybody) because it allows us to take a step back and focus on our passions, examine what makes us unique, and reflect upon where we want to be. As a starting point I took a few minutes to think about my own personal mission statement. This may sound all life coach-y but that wasn’t what I had in mind. I just wanted to jot down some quick notes about how I envision my ministry in general and at St. John’s in particular. If the rector’s personal sense of mission doesn’t have some major overlap with the parish’s, there may well be a problem. Hopefully both rector and parish discern such congruence during the call process. If not, it’s a template for future conflict. 1. Grow the church numerically, spiritually, and financially (not because bigger or more is better but because of the Gospel mandate to share the Good News). 2. Share the Good News of Jesus Christ locally, nationally, and globally. 3. Build joyful community where people are drawn ever-deeper into relationship with the risen Christ. 4. Help people to take their faith, but not themselves, seriously as they encounter the divine in everyday life, not just on Sunday morning. That was it. At some point I could always extend the exercise by adding goals and objectives under each one but I probably won’t. Who has the time? But I did find it helpful and suggest everyone engage in a similar process at some point whether or not your parish/organization/business is engaging in a mission statement revision. This won’t be the first parish where I’ve been involved in such a process. When I was a freshly-minted rector serving a parish in New York I noticed there was a major problem with the mission statement: namely that God wasn’t included. So we went through the process and, a few months and several semi-colons later, had one that much better reflected the faith of the community. I’d like to think God was well pleased. Dr. Seuss writes this about the Grinch’s response to the Who’s Christmas celebration. 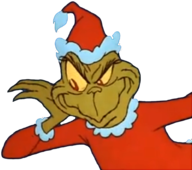 We know how this turns out (spoiler alert) — the Grinch’s heart grows three sizes and he ends up carving the roast beast at the Who’s Christmas feast. The noise consists of the ongoing commentary, complaints, and suggestions that surround leaders. It comes through face-to-face conversations, e-mail, cell phones, and he said/she said triangulation. At its worst, all of this peripheral chatter distracts a leader from the big picture vision casting that is essential to an organization’s vitality. It can so subsume daily interactions to render the leader ineffective as he/she spends each day reacting to every minor crisis that bubbles up rather than the major one that may be lurking around the bend. It’s hard to keep a broad view when the minutiae of everyday life keeps drawing you back again and again. As a church rector for the past decade, the whole notion of “the noise” resonates profoundly as I’m sure it does with most anyone who has served in parish leadership. I also think the noise in church settings is particularly emotionally charged — more so than a typical business environment. And thanks be to God for this! We all bring “our selves, our souls and bodies” into our interactions at church. That is, we bring our spiritual and human fragility right into the mix which can lead to emotional volatility born of insecurity and passion. 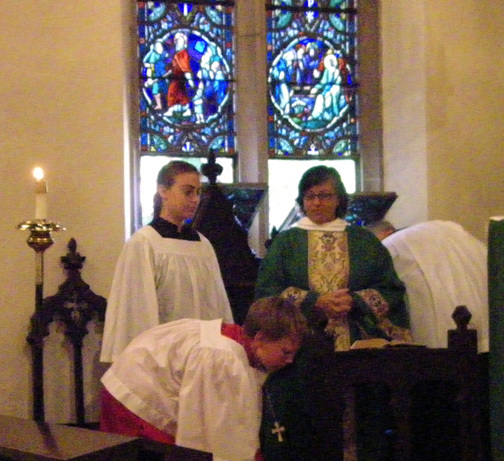 This weekend we had four services at St. John’s to mark All Saints’ Sunday — our new Saturday at 5 pm contemporary liturgy; Sunday morning services at 8 and 10 am (with five baptisms and the reading of the necrology); and solemn evensong on Sunday evening. 1. There were too many baptisms — it was distracting; I loved all the baptisms — it was exciting! 2. You used too much incense; Can’t you use more incense? 3. The joke you made during the announcements was offensive; That was the funniest thing I’ve ever heard! 4. There were so many cars in the parking lot, I had to park way up the street; There were so many cars in the parking lot, I had to park way up the street! At it’s best, all of this “noise” can lead to some constructive conversations. Perhaps the solemnity of reading the necrology (list of people who have died in the last year) — something that means so much to many parishioners — shouldn’t happen on a day that is so full of (loud) life. I actually love the juxtaposition but I don’t have to sit in the back of a crowded church. Ultimately much of the noise I hear on a regular basis is a result of growing pains. I understand that and as long as that’s the source I hope it continues to be loud. The often elusive balance for a leader is to be responsive, sensitive, and pastoral in dealing with “the noise” without allowing it to compromise the church’s mission. On this score, sometimes I succeed and sometimes I fail. And it’s at times like this that I’m particularly grateful to have strong lay leaders willing to engage with me and the entire parish. In the meantime I’ll be headed back to my laboratory to work on that skin thickening agent I’ve been trying to develop for the past 10 years. It’s not about the numbers. At least that’s what priests will tell you even as they’re totaling the Sunday attendance in their heads during the Epistle. 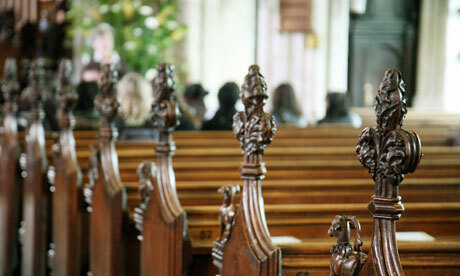 Some clergy are obsessed with the numbers, as if their value in God’s sight was directly related to the ir parish’s Average Sunday Attendance (ASA). You’ll be glad to know that mine isn’t. I link my self-worth to the number of friends I have on Facebook. Numbers are, of course, quantifiable. In a vocation where you sow more seeds than see tangible results, there’s something comforting (or disconcerting) about the black and white quality of your ASA. While I’ve seen some clergy inflate their ASA like Vietnam body counts, most are as faithful and accurate as is humanly possible. I always figure if I’m slightly off, God knows the actual total and that takes the pressure off. The diocese gets as close to the truth as I can offer. What you can’t ever quantify is spiritual depth. You could count the number of programs offerred and balance it with attendance at, say, Bible Study or the Wednesday night Lenten series. Or come up with some other Bill James-like statistic for the back of your next clergy trading card. But this can never adequately tell the story of how many people have grown in their relationship with the risen Christ in the past twelve months. I’ve been thinking about attendance figures as we sit on the cusp of another Program Year (generally post-Labor Day through Memorial Day, although I generally push it out through mid-June). 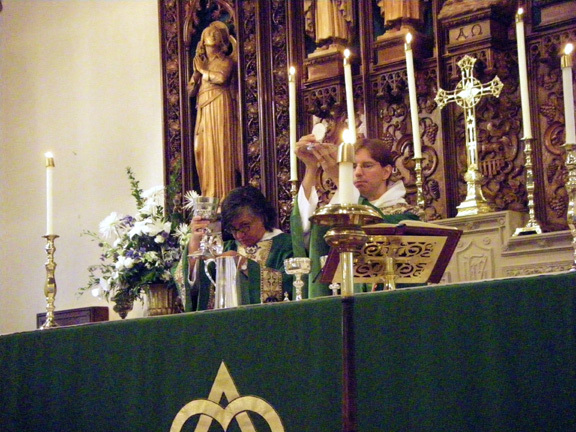 Like most parishes we see a major surge in attendance on that first Sunday after Labor Day. The kids are back in school, families return to their regular routines, the choir returns, Sunday School starts, and everything cranks back up. The problem with the ASA is that it doesn’t take the Program Year into consideration. As much as I try to bang the drum about Summer attendance (and will continue to do so), it drops. Dramatically. And thus, the 12-month ASA figures don’t tell the full story. I propose that parishes offer more than just that single number as we try to determine just how many people attend church on an average Sunday. In addition to ASA, I’d like to see churches also share their PYASA (program year average Sunday attendance). This would give a better picture of what each church looks like during the church “season” (recognizing that God never takes a vacation from us). Not every parish’s Program Year is the same. Attendance trends at a church on Martha’s Vineyard during the summer would look very different from the average parish whose numbers drop. And a parish with minimal summer dropoff may be doing some creative things to keep people in the pews. Such data may also shift among wealthier communities where more families, presumably, can spend significant time away whether on vacations or at summer homes. Out of curiosity I tracked these numbers at my own parish, St. John’s in Hingham, Massachusetts. St. John’s is an affluent community on Boston’s South Shore. In addition to the summer dropoff, there’s a “ski factor.” A good number of families rent or own seasonal ski houses and spend most winter weekends out of town. There are people I literally only see two seasons out of a given year. For this reason I’ve broken it down even further. The Winter ASA mirrors ski season — the Sunday after Christmas through mid-March (12 weeks). In New England, winter attendance is also affected by those weekend snow storms which also impact Sunday attendance. So maybe it is about the numbers. At least to a degree. We all hope to grow our parishes not for our own egos (in parish ministry bigger is not better; bigger is simply different). But the main motivation for growth is to bring more people to know the power and peace that comes through faith in Jesus Christ. I’d be interested to hear your thoughts or see your figures if you calculate this at your own parish. Who knows? Maybe we’ll learn something. And if not, it’s been kind of fun. Mother Anne, as she’s known in these parts, preached her first sermon — and did a very fine job I might add; served as deacon of the mass (she’ll be priested in January); and survived, I mean attended, her first coffee hour among us. As great as it is to begin a new ministry, it’s always a bit of a relief to have the first Sunday over with. There will, of course, be hiccups along the way but there will never again be another first Sunday. As people return from vacations, Anne will continue to meet people for the first time. Every week for the next two months I’d imagine. But in time the faces that now blend together will start to look familiar and names will even be attached to them. A first call as an ordained person is exciting, overwhelming, and fun. After years of discerning and studying, you’re finally doing what you have been called to do! And that is a great gift to both the individual and to those among whom you serve. 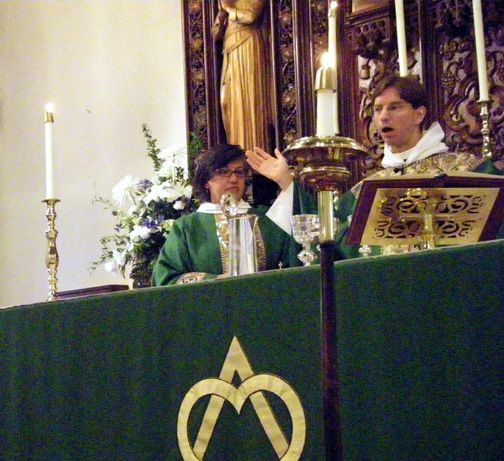 I admit to reliving some of my first days as a curate at Old St. Paul’s in downtown Baltimore. I had a terrific rector who was and is both a friend and mentor. We did a lot of great ministry together at OSP and I look forward to having a similar experience with Anne. And, okay I’ll admit it, I mostly wrote this post so I could share some pictures of Mother Anne’s first Sunday at St. John’s. Thanks to our organist, Dr. Fred Guzasky, for taking them unbeknownst to either one of us. Very sneaky indeed. Enjoy. I smell a reality TV show in the offing. “Clergy Encounters of the Extreme Kind” would have spouses yelling at their clergy husbands/wives as they attempt to conduct pre-marital counseling (“I can’t believe you’re stressing communication to these two. Why don’t you practice what you preach for once in your life?!”). Haggling over personal finances in the sacristy just before the 10:00 am liturgy (“Okay ‘God Guy’, why couldn’t you have been ‘called’ to be an investment banker?”). A vestry meeting being conducted at the dinner table during a family meal (“Would you please pass the salt and do something about the out-of-control flower budget?”). In reality it is a tricky balance. Clergy have taken two vows: one to our spouses and one to our God. And at times there’s tension between the two demands — the demands of family life and the demands of parish life. 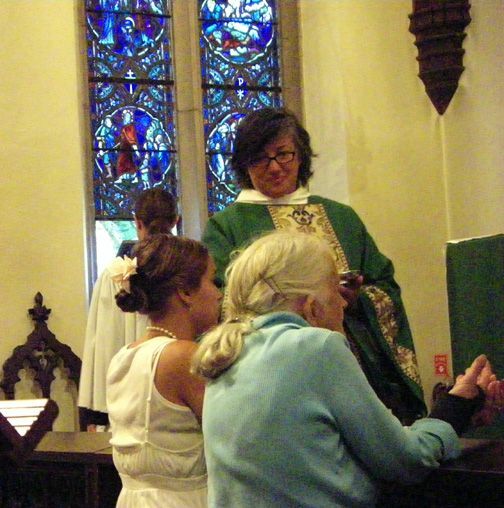 The priest who performed our wedding at the Church of the Redeemer in Baltimore (I was in the ordination process at the time) used to always tell me that the vow represented by that ring on my left hand always came first. This advice has come in handy on more than one occasion. But it’s always a work in progress — BlackBerry’s and laptops don’t help matters. Much of the research revolves around setting appropriate boundaries — between your personal and professional lives. Of course some of the “solutions” are pretty funny. One priest swears by having his wife answer his cell phone to screen calls on his day off. Solange DeSantis — the friend and editor extraordinaire who forwarded me this article — already has her take on this one: “I can hear it now – ‘Bryna, honey, here’s my cell phone, would you handle all my calls today? Be sure to take messages and tell them to please respect my boundaries.’ Fill in the ^%$&^*&^&* answer from Bryna.” I couldn’t have said it better! Then there’s the priest (I’m not making this up) who is quoted as having “had a six-foot stockade fence built between the church and the rectory to physically separate her work and her home.” You can’t see me! You can’t see me! Gotta go now — I’m off to dig a moat.